Value Stream Mapping is a Lean Manufacturing tool that uses a flow diagram to document in great detail every step of a manufacturing process. The Value Stream Mapping solution from ConceptDraw Solution Park extends ConceptDraw DIAGRAM software with a new library that contain vector objects, samples and templates. With this well-designed vector objects users can draw Value Stream Mapping diagram. Also users can export resulting document to PDF, PowerPoint, and other popular graphic formats. Pic.1 VSM diagram - Production control. 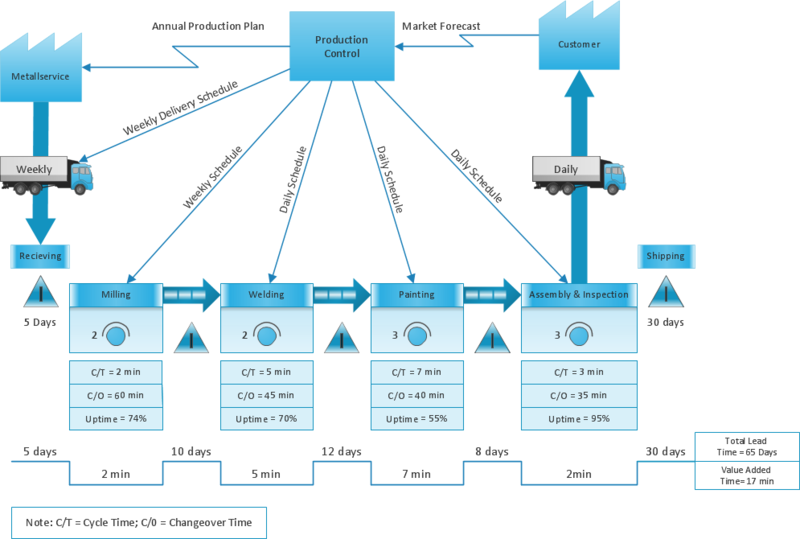 ConceptDraw Value Stream Maps are used in lean practice for analysis of manufacturing processes to identify the improvement opportunities. The new Value Stream Mapping solution found in the ConceptDraw Solution Park continues to extend the range of ConceptDraw DIAGRAM v12 into a business graphics tool. Use ConceptDraw DIAGRAM v12 extended with Value Stream Mapping solution for document processes with professional designed Value Stream Mapping template.